Love clematis vines? These tips will help you choose clematis trellis to give your flowering vine the support it needs, plus tips for proper placement for plant health and maximum growth and blooms. This is part of the Complete Clematis Care Guide with tips on planting, propagation, fertilizing, and more. 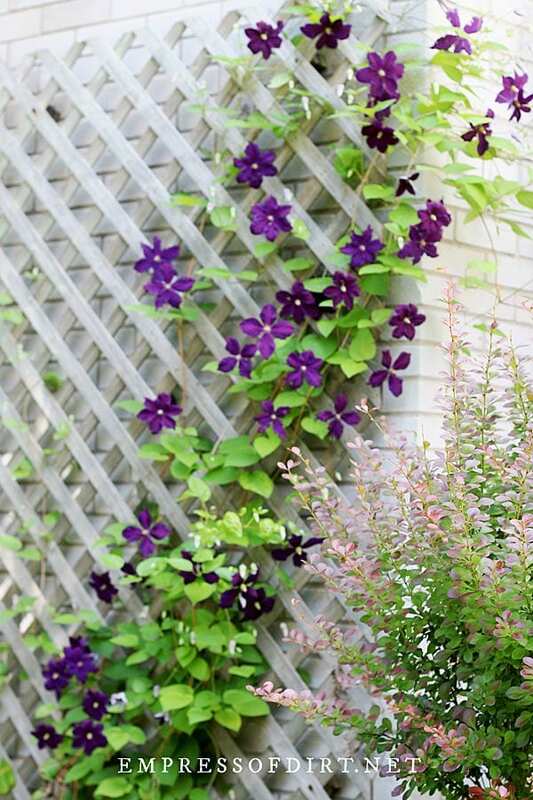 Clematis is a beautiful, flowering perennial vine but it can be tricky to choose the right trellis. Part of your decision will depend on whether you will be monitoring its growth carefully and guiding it along, or whether you will likely leave it to find its own way. I mention this because clematis vines are quite delicate. They grow plenty of spindly stems with tendrils on the ends that wrap around anything they come into contact with. This can be problematic if they have managed to grow in the wrong direction, or wrap themselves around the wrong support or other plants. You may have noticed this already in the garden nursery when the clematis vines are placed next to each other and become completely intertwined. You either have to buy the lot and plant them as one unit, or damage the stems to get them apart. Once we’ve planted a clematis in our garden, the goal is to provide optimum growing conditions and support without ending up with a big tangled mess in a few years. So, what’s the best trellis to use? If we use a typical garden trellis, the support pieces are usually too far apart and can be too thick. Clematis tendrils need to grab onto something about every six inches at most, and they are most likely to succeed if the target is a half-inch thick or less. A one-inch thick piece of trellis wood may be too much for the tiny tendril to work around. If we add fine mesh or hardware cloth to the face of a trellis, the tendrils have plenty of places to grab, but, as the plant matures, it will be locked in place. All that green growth gradually become woody and unbendable, and like it or not, that clematis is there to stay. The one saving grace is, if your type of clematis is group 3, you can trim it back hard after fall flowering, and have a fresh chance at training it in the spring. But the other groups (1 and 2), that require little or no pruning, are there for years. 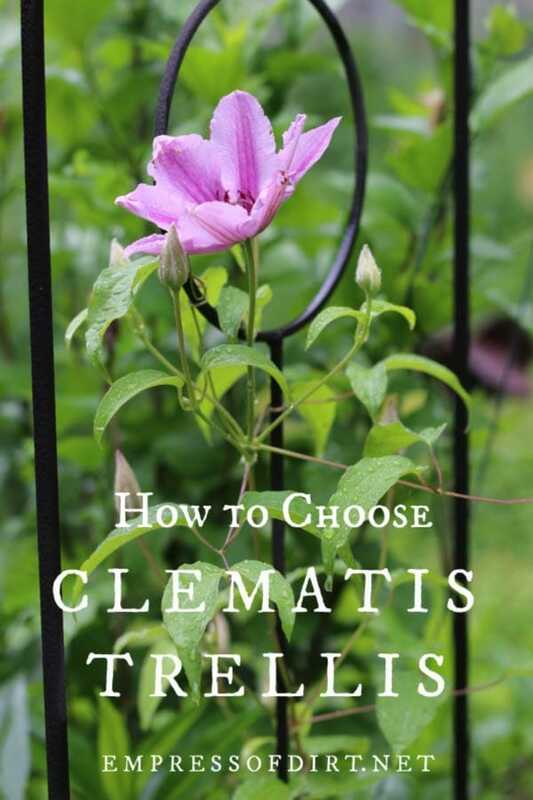 This shows the types of clematis and how to identify yours. The first few years of growth are the honeymoon period, but eventually, if left unchecked, the top area of clematis vines with all the flowers can get so top-heavy that the stems bend and die, and light and air cannot reach the undergrowth. It’s kind of heart-breaking when this happens to a fabulous clematis! My personal solution is to get a standard trellis—it can be wood or metal—and compromise by using natural twine to tie the stems in place as they grow, fanning them out so they will not cover or compete with each other. Some other gardeners use fine wire or fishing line, but I have found both a bit fussy compared to the twine. I get it though that some may not like the look of the twine while the clematis is young and there isn’t much foliage to hide it. Personally, I use natural twine to solve all sorts of garden problems. Inconsistent watering | see How Often Should I Water My Houseplants? Here’s some tips to give your clematis a good start and avoid it becoming a tangled mess. 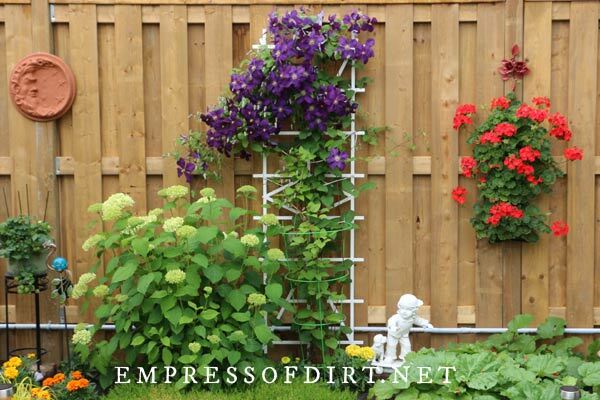 This clematis trellis is mounted away from the wall to allow room for growth and air circulation. Pick wood or metal trellis that matches the expected height of your vine. Some grow up to 30 feet long, so you will need a clever extension plan for those. Some ask if metal trellis might become too hot for the clematis tendrils in the sun? I have a few vines growing on metal trellis and I haven’t noticed any problem. Some gardeners use wire and eye hooks, which works if you have places to attach them and can monitor the vine to be sure it grabs where you want it too. 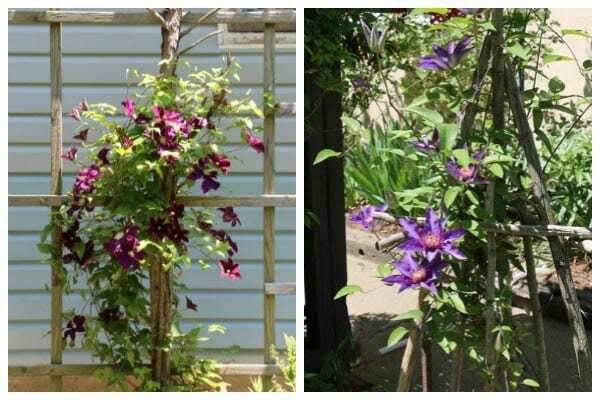 Put your trellis in place before planting your clematis vine. It’s far too easy to damage the plant when trying to add a trellis after some growth has taken place. If you are placing the trellis near a fence or wall, mount it six inches away from the wall, not flush against it. This allows the clematis to grow up both sides for better grip and allows better air circulation. Planting next to walls can also reflect extra heat so be careful that the soil is never allowed to dry out. Know which pruning group your clematis belongs to (1, 2, or 3). Groups 1 and 2 can go with little or no pruning, other than removing dead, damaged, or diseased stems and leaves. Group 3 is the one that gets cut back hard in fall (down to 6-24-inches depending on how big and mature the clematis is), which is handy if your plant grows into a tangled hot mess. You can cut it down in fall and start over in spring. Have a plan for guiding the plant as it grows and have your supplies ready. You can either add mesh or hardware cloth to the face of the trellis, or use natural twine to hold the stems in place every six inches or so. Mesh is helpful because the tendrils can easily grab it but troublesome because it locks them in place. Twine is easy to apply and can be moved, but you many not like how visible it is. Plus, you do have to babysit the vine and add the twine as needed. I just know to carry twine and scissors during my daily garden inspections. Don’t expect clematis to grab onto the trellis by itself. It’s a contact sport, and only if the tendrils touch a surface can they wrap around it, and only then if it’s not too thick. Without support, the vine will bend and flop over, possibly causing fatal damage to the stems. You can use another shrub or tree as trellis so long as the roots don’t compete for resources. The clematis will not tolerate dry soil (it will die), so plant with this in mind. They also need full sun (at least six hours a day) to ensure flowering, so don’t do it if the overhead tree foliage is going create a canopy of shade by mid-summer. This one isn’t about trellis, but important for the health of your plants. Beware of common diseases that affect clematis vines. Some problems, like clematis wilt, may not kill your plant if you act right away to stop the spread. You can find more information on clematis diseases here. I loathe these problems because one day you can have the most spectacular vine, and the next day the wilt has blackened and withered the entire plant down to the ground. Not nice at all. It can be mounted to stand strong and firm. It looks great in your garden. It is placed away from walls so the vine can grow on all sides and get air circulation. It has places to attach wire or string for tying the tendrils in place. It accommodates any necessary pruning. I hope this helps! There is no perfect way to add trellis to clematis, but, if you know how much you’re willing to help it out, and if you can live with some messy but (we hope) flowerful overgrowth, it will be fine. Because truly, when it comes to clematis, that is the nature of this wonderful beast.